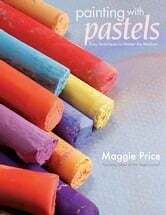 Come enjoy the art of pastel painting with beloved workshop instructor Maggie Price. In this step-by-step guide, she teaches you everything you need to know to make the most of this accessible art form. From selecting the right materials to learning the fundamentals of composition, Maggie starts with the basics and progresses to 21 complete pastel demonstrations that detail specific painting techniques and effects. With its blend of visual instruction, thorough guidance and breathtaking artwork, this is the only guide you need to experience the joy and satisfaction of painting with pastels.